Due to previous experiences working at the Smithsonian Institution and the National Geographic, I was relatively well-prepared for the challenges inherent in processing substantial quantities of oversize materials in the Image Collections and Fieldwork Archives (ICFA) of Dumbarton Oaks. Certainly, I was cognizant of how large format materials present a unique challenge to archives, since their physical size requires different organizational and storage needs than normal-sized documents (e.g., personal papers and correspondence). In addition, the oversize items in ICFA has been intellectually separated from their parent collections; therefore, the context or relationships between the items was lost and needed to be restored. Cultural Heritage Information Management Forum Next June! The Department of Library and Information Science has just announced that it will host the Cultural Heritage Information Management Forum in Washington, DC on June 5, 2015. This forum, which will serve as an arena for CHIM practicum project presentations, addresses the growing body of research and scholarship in the digital cultural heritage discipline. Submissions will be accepted between February 2, 2015-March 30, 2015 and are open to all researchers, practitioners, and students in the cultural heritage discipline. Stay tuned for more information about this upcoming forum! This post was started last week. But, what with due dates, work, papers, and snow storms, it kinda didn’t get done. So, here it is, for your enjoyment! A few weeks ago, I gave a poster presentation at CUA’s 6th annual Bridging the Spectrum symposium. And while this wasn’t my first LIS conference/symposium/get-together, it was — in fact — my first time presenting at one. My topic? 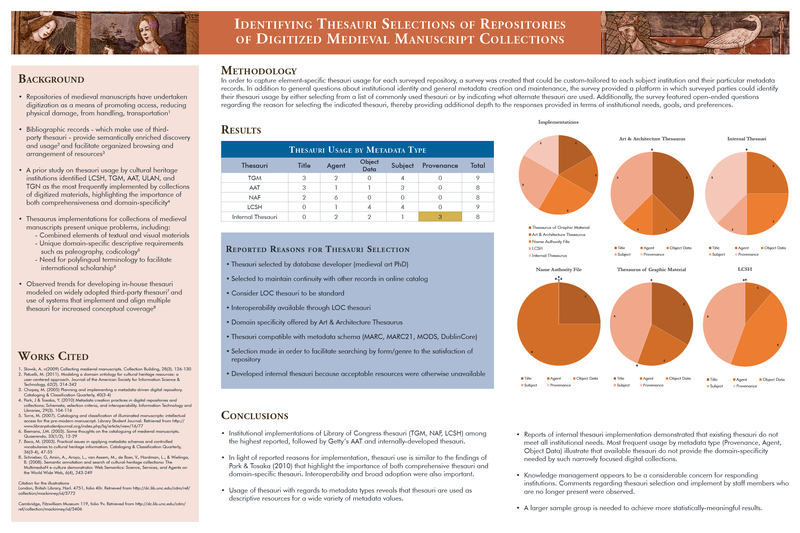 Identifying Thesauri Selections of Repositories of Digitized Medieval Manuscript Collections. My poster session was a great success. Loads of interested symposium attendees stopped by, asked good questions, and seemed generally interested in the topic at hand (namely, just what sort of thesauri do digital collections of medieval manuscripts use and why do they use them?) Now, fair reader, I can sense your budding excitement as you read this. Wish you had been there to see the poster in action? Well, look no further! A fellow cohort member was kind enough to capture my spiel on camera. And while I could prattle endlessly about my survey, the interesting findings, and the possibilities for future research (if anyone reading is in a position to offer grant money, I won’t say no), I’d rather focus the environment of the symposium itself. As with any profession, the work that we do as graduate students, as librarians, as information pros can sometimes be overwhelming. And when the responsibilities start to build up, we can bury ourselves in our own little worlds, focusing on the mountains of work that require our attention. I think that this is precisely why symposiums are so important: they allow us an opportunity to step away from our work and to be around similarly-focused professionals who wish to share their accomplishment in a public forum. Thanks to the many panelists, poster presenters, and attendees, I had the opportunity to learn about a whole host of new and interesting studies that are going on as I type this. Everything from indigenous modes of recordkeeping among the Sioux people to new approaches to faculty engagement at research libraries was on display. Conversations simmered at every table and the Twitter conversation was at a continual boil for most of the day (for those interested, check out #cualis14. Some great comments and a link to the Michael Edson’s keynote presentation, video is now available at CUA LIS’s homepage). While I won’t use the word ‘impossible,’ it would have been pretty difficult to have walked away from this event without feeling revitalized, fascinated, and totally revved up for the future of the Library and Information Science discipline. After having such a wonderful time learning about new research, studies, and initiatives, I began to wonder about what some of the other motivations for attending conferences, symposia, and other LIS events. I was somehow reminded of John Falk’s “The Museum Visitor Experience: Who Visits, Why and to What Effect?” In this essay, Falk identifies several classes of museum patrons, including Explorers, Facilitators, Professionals/Hobbyists, Experience Seekers, and Rechargers, all of whom have a variety of legitimate but unique reasons for attending museums. While the format, structure, location, attendees, and overall attitude of a conference is different from a conventional museum, can some parallels be drawn between museum attendance and conference attendance? Some attend to expose themselves to new innovations in their given field while others attend to develop their professional calling or individual passion. Others still attend to meet others and make professional connections, others yet use conferences as an opportunity to refresh their professional outlook and workshop ideas & projects. While the comparison may be tenuous on first pass, it may bare up with increased consideration. But still: the conference as a cultural engagement is an interesting idea. Regardless, the Bridging the Spectrum symposium was a great experience. In the future, I would highly recommend attending. Major thanks to CUA and the Department of Library and Information Science for their efforts to organize such an awesome event. Oh, the memories of staying up late to play with my… bee hive smoker? The Richard Balzer Collection — a self-declared Wunderkammern of visual entertainments — does just that. The collection hosts a plethora of toys, shadows, peep shows, phenakistascopes, zoetropes, and more, providing a rather interesting insight to the various modes of entertainment from a by-gone era. But more than that, the collection website offers Flash animations of many of the moving entertainments, allowing modern day viewers to see just what audience members would have seen nearly 200 years ago. Apparently, lions eating children was entertainment back then. The animation element of the Balzer Collection site illustrates an interesting element of these antiquated novelties: accessibility and interoperability. Usually, these terms are used with regard to more modern media such as cassettes, film, and computer files and the ability to understand or use them once they have fallen from popular use or become obsolete. However, an important element of properly understanding these visual entertainments is not only comprehending the remaining physical artifacts. To really understand what was experienced, these objects have to be seen in the context in which they were intended to be seen, which is to say: in motion. And while we may be able to conceive of these objects as moving entertainments, if we cannot experience them as they were intended, a key part of the experiential knowledge of the objects is lost. And even though we may not have the complex spinning apparatuses or the rear-lighted peep show cases that are required, the Balzer Collection has employed GIF technology to ensure a proper migration into a format that is useable in our current tech environment. Be sure to check out the Richard Balzer Collection. They also post a blog for updates to their collection and their ever-increasing collection of animations. A tip-of-the-hat to Huffington Post for bringing it to my attention.